When Should I Call My Silver Spring Plumber? Let’s face it: plumbing problems are always a hassle. There is never a good time for a toilet to become clogged or a pipe to burst but it’s one of the unfortunate realities of being a property owner. 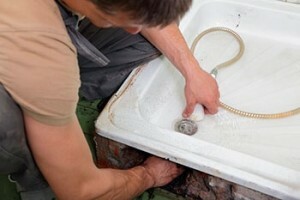 Many homeowners are tempted to fix plumbing problems on their own but in some cases that’s not always the smartest bet. In today’s blog, we look at some plumbing problems commonly experienced by Baltimore homeowners and advise whether you can fix it yourself or if you should call in the help of a professional. Should you DIY or call a plumber? Every homeowner and renter has probably experienced a clogged toilet at some point in their lives. While it’s an incredibly annoying problem to have, it’s also one that’s quite simple to fix yourself. A solid plunger will usually take care of a clog, though sometimes it takes longer than you might think to work it out. If that doesn’t work, you may be tempted to try liquid drain cleaners but we advise against that as the caustic chemicals can cause your pipes damage over time. Try a plumbing snake instead. When the water pressure suddenly drops, it can mean a number of things. If you only notice the problem in one fixture then it’s likely because your aerator has become clogged with debris. This is an easy plumbing problem to DIY. However, if you notice that the pressure throughout your house has decreased then it’s likely a much bigger problem than you can handle yourself and your trusty Silver Spring plumber should be called in. Call in the reinforecements! Leaking and burst pipes can quickly lead to significant water damage in your home and this fix is beyond the skill of even handy homeowners. Be sure to bring in a plumber as soon as you notice signs of pipe leaks. Got plumbing problems? Give Master Plumbing & Mechanical a call at 301-650-9100 and let our experienced plumbers get the job done right. No job is too small and now that school is out and with winter coming up it’s the perfect time to take on that plumbing project that you’ve been putting off. This entry was posted on Thursday, October 29th, 2015 at 8:29 pm. Both comments and pings are currently closed.